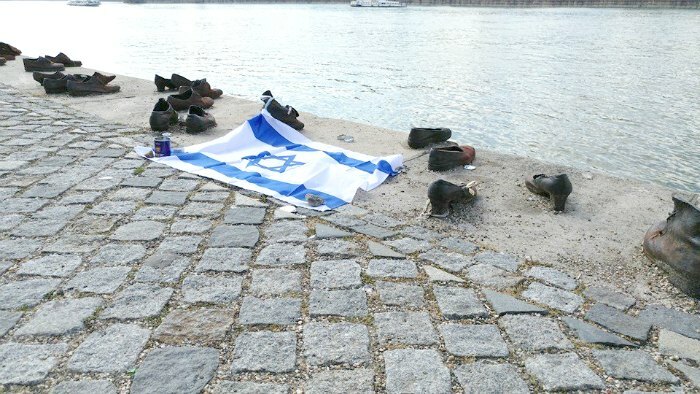 Shoes on Danube – a Memorial for the Murdered Jews who were shot during the holocaust. A long line of iron shoes standing on the bank of the Danube in memory of the Jews that were shot here by the Hungarian Arrow Cross Militants straight into the Danube, some still alive. 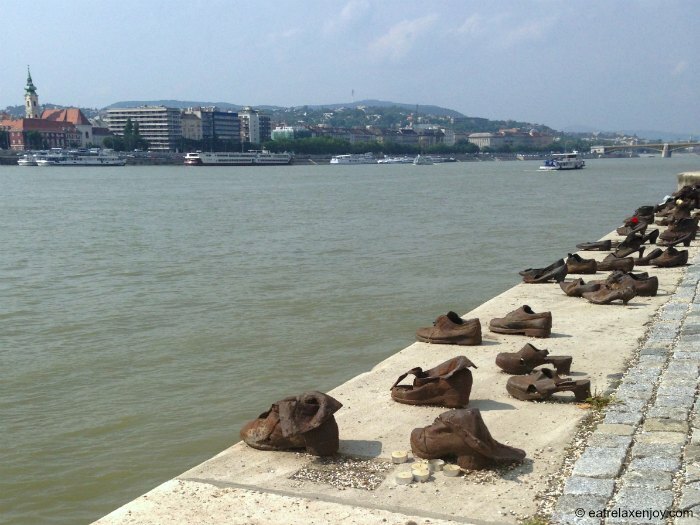 The Memorial Shoes on Danube is located near the Hungarian Parliament on the “Pest” side. It is about 20 meters long and is constructed of iron shoes, a total of 60 non-identical pairs. Each pair of shoes has its own characteristic – woman shows, men shoes, boots, each with a different location and ‘personality”. It is an organized mess of shoes, not a symmetric display of shoes. This has strength and it expresses the individualism of each victim. The memorial was created by Gyula Puer and Can Togay in 2005 as part of the marking of 60 years for the ending of World War II (I assume this is why there are 60 pairs of shoes). Near the Memorial there are plaques in three languages: Hebrew, English and Hungarian. 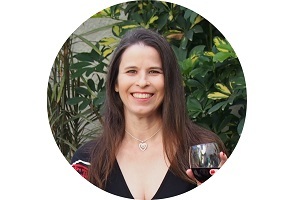 “לזכר קרבנות שנורו ונרצחו ע”י אנשי צלב החץ על שפת הדנובה ב-1944 וב-1945 זכרונם לברכה”. Hundreds of Jews were tied and shot here between 1944-45 by the Hungarian Arrow Cross Militiamen. Considering this, there is a lot of criticism regarding the text on the plaques, as they don’t state that the victims were Jewish and the writing is anemic (the word murdered is omitted from the English version) and takes no responsibility in the name of the Hungarian people. 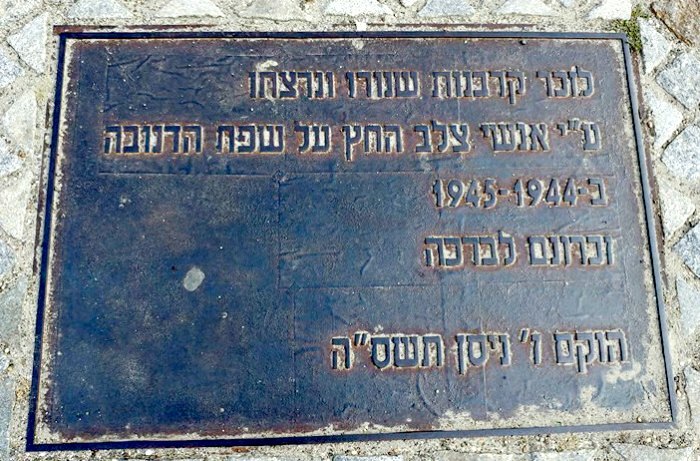 An Israeli Facebook community helped me with this article and provided me with photos of the plaques. One of them told me that the grandfather of her mother was murdered there. Another one sent me a photograph of the Israeli flag with memorial candles placed on the memorial. The story of this crime is still in the hearts of the Jewish people. 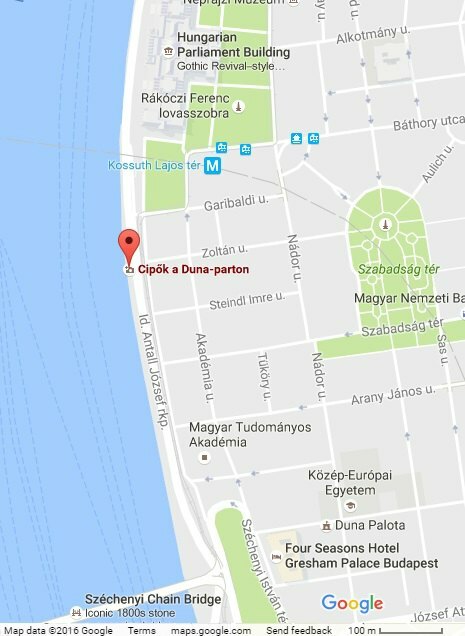 And I believe this is a mandatory place to visit for Jewish people and for anyone with morals visiting Budapest. 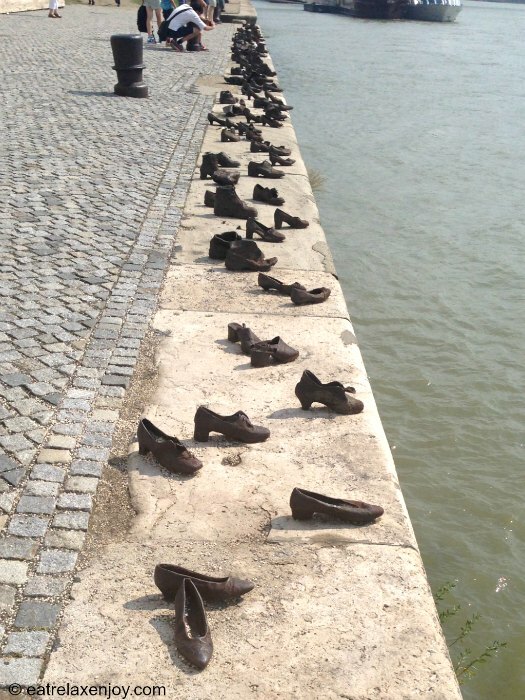 Shoes on Danube Memorial is located on the river bank south to the Hungarian Parliament buidling and north of the Chain bridge.